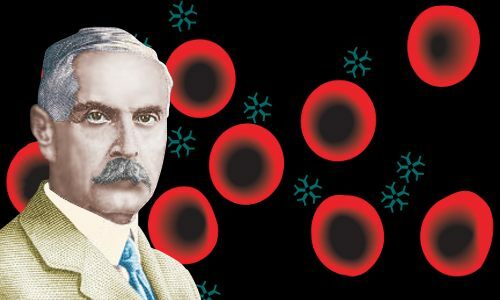 Karl Landsteiner revolutionized medicine when, in 1900-1901, he identified three major human blood types: A, B, and O, which led to safe blood transfusions and millions of lives saved. He also suggested the use of blood types to assist in police enquiries. Thirty years later, he was awarded the Nobel Prize in Physiology or Medicine for his discovery of the ABO blood group system. Working with Erwin Popper, Landsteiner proved polio is an infectious disease spread by a virus and, with Viktor Mucha, he showed that dark-field microscopy could be used to diagnose syphilis. Later in his career, Landsteiner and his colleagues made another life-saving scientific breakthrough when they discovered the Rhesus factor in blood. Karl Landsteiner, the only child in a prosperous Jewish family, was born on June 14, 1868 in Baden bei Wien, a spa town 16 miles south of Austria’s capital city, Vienna. Karl’s father was Leopold Landsteiner, a doctor of law and editor-in-chief of Die Presse, a quality newspaper. Leopold died when Karl was seven. Karl was very close to his mother, Fanny, née Hess. Following her death in 1908, Karl, who was by then 40 years old, had her death mask taken and, rather morbidly, kept it on his bedroom wall for the rest of his life. From the age of 12, Karl was educated at the State Grammar School in Linz, a city 115 miles west of Vienna. He entered the University of Vienna’s medical school in 1885, age 17. In 1891, just before his twenty-third birthday he obtained his degree: Doctor of General Medicine. The year before he graduated, Karl Landsteiner and his mother converted from Judaism to Roman Catholicism, responding perhaps to rising levels of anti-Semitism in Vienna at the time. While working for his medical degree, Landsteiner became fascinated by organic chemistry. Rather than pursue a career as a practicing physician, he decided to work in research. He spent several years working in Germany and Switzerland learning state-of-the-art laboratory techniques with some of the biggest names in organic chemistry, including Emil Fischer. He kept in touch with medicine by working in the University of Vienna’s surgical clinic. On January 1, 1896, age 27, Landsteiner was appointed assistant in Vienna’s Institute of Hygiene. Working there, he developed a passion for immunology and especially the immune response of blood serum, the pale yellow liquid that carries all the substances in blood around the body. The following year he transferred to the University of Vienna’s Pathology and Anatomy department. He continued pursuing his immunology and blood serum work with enormous energy, performing thousands of autopsies and publishing 75 research papers – over 50 of these papers concerned serology, the study of body fluids such as blood serum. In 1900, age 32, Landsteiner studied the effects of mixing red blood cells from one person with serum from another. He found the mixtures often produced clumping of the red cells – or hemagglutination in medical jargon. Other scientists believed hemagglutination was a disease-linked response, but Landsteiner’s blood cells and serum were taken from healthy people. In Landsteiner’s experiments some mixes of blood and serum led to no hemagglutination, while others did. He deduced the existence of three blood groups, which he called A, B, and C. Today these are known as A, B, and O. In 1902, Landsteiner’s colleagues followed advice he gave them and identified a fourth type – the AB group. Landsteiner found that mixing blood from people of the same blood group resulted in no clumping. Mixing blood from people with different blood groups could result in hemagglutination, which he identified as an immune response. Previously, scientists had abandoned using blood transfusions because they could cause severe illnesses or death. Landsteiner showed blood transfusions failed because incompatible blood groups were mixed. The four major blood groups. The red cells have different antigens sticking out from their cell membranes. Antigens are molecules that produce an immune response. In red blood cells the antigens are sugars or proteins. When the immune system detects an unfamiliar antigen it attacks it – this can happen if someone receives a blood transfusion of an incompatible blood group. 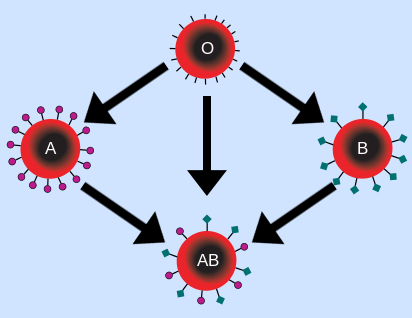 Antigens determine that blood can be transfused safely between people with the same blood group. Moreover, O-group blood is safe for everyone, while A-group and B-group are safe for people with AB blood. AB-group blood is only safe for other people with AB blood. Dr. Reuben Ottenberg carried out the first clinical blood transfusion based on Landsteiner’s research in 1907 at Mt. Sinai Hospital, New York. Blood transfusions were used to save wounded soldiers’ lives during World War 1. Transfusions became practical after several different scientists in 1914 discovered that sodium citrate stabilizes blood for several days, allowing it to be stored. In 1917, Captain Oswald Robertson of the U.S. Army, attached to the British Army on the Western Front, began the world’s first blood bank. In 1903, with his colleague Max Richter, Landsteiner showed how a blood group could be determined from a sample of dried blood, and suggested this could be used in crime-fighting to narrow the list of possible suspects. Today, in America alone, over 4 million blood transfusions are carried out annually. The sexually transmitted disease syphilis provided Landsteiner with his next major breakthrough. In 1905, he was the first scientist to discover the means to infect monkeys with syphilis, opening the door to further research. The following year, working with Viktor Mucha, Landsteiner found dark-field microscopy could be used to diagnose syphilis by detecting the bacterium that causes the disease, Treponema pallidum. 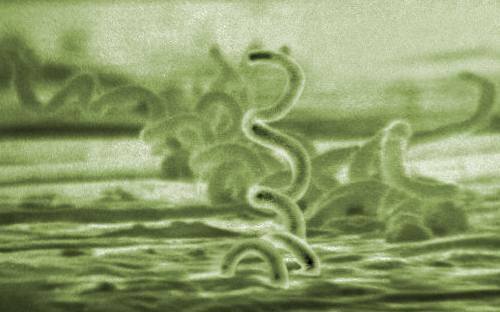 Electron micrograph image of Treponema pallidum courtesy of Centers for Disease Control and Prevention. In 1908, Landsteiner was appointed chief of pathology at Vienna’s Wilhelmina Hospital. In the same year, working with his assistant Erwin Popper, he proved that poliomyelitis is an infectious disease, successfully infecting monkeys with it, and identifying the disease-agent as a virus. In 1919, age 53, Landsteiner left Vienna for Holland’s capital city The Hague. There, at the Catholic St. Joannes de Deo hospital, he carried out what he regarded as his best and most important work. He said that almost anyone could have discovered the blood group system – it was just good luck that it fell to him. However, his discovery in 1921 of haptens was different. He believed few others could have done it at the time. Landsteiner gave the name haptens to very small molecules that, alone, produce no immune response in a body. However, if they are attached to a large carrier such as a protein, they provoke an immune response. Landsteiner pioneered the use of synthetic haptens, adding small molecules to proteins to provoke immune responses. In doing so, he made an invaluable contribution to immune system chemistry research. Lecture: The Origins of Molecular Biology and Molecular Medicine. May 20, 1986. A large amount of immune system research today involves haptens. In the spring of 1923, Landsteiner arrived with his wife and son in New York City. He had been offered and accepted full membership – the highest rank – at the Rockefeller Institute for Medical Research. In 1927, working with Philip Levine, Landsteiner discovered new blood groups: M, N, and P.
In 1937, with Alexander S. Wiener, Landsteiner discovered the Rhesus factor, now called the Rh factor. They published their work in 1940. Compared with the ABO group blood system, the Rh system has different antigens on the surfaces of red blood cells. Most people’s blood is Rh positive. If an Rh negative mother is pregnant with an Rh positive baby, the mother’s immune system may attack the growing baby. The identification and understanding of the Rh factor led to methods preventing the mother producing antibodies against the baby in her womb. Identification of the Rh factor also explained the fact that blood transfusions between people with ABO compatible groups sometimes led to problems. After the Rh factor’s discovery a plus or minus sign was added to a person’s ABO blood group. For example, people whose blood was once classed as A, are now classed as A+ or A-. 1911 – Chevalier of the French Legion of Honor. 1926 – Aronson Prize for achievements in microbiology and immunology. 1930 – Nobel Prize in Physiology or Medicine. 1930 – Paul Ehrlich Medal. 1932 – Elected member, National Academy of Sciences. 1933 – Dutch Red Cross Medal. 1941 – Elected Honorary foreign member, Royal Society. 1946 – (Posthumously) Albert Lasker Clinical Medical Research Award. In 1916, age 48, Landsteiner married 36-year-old Leopoldine Helene Wlasto, a member of the Greek Orthodox Church. Before they married she converted to her husband’s Roman Catholic faith. In 1917, Leopoldine gave birth to their only child, Ernst Karl, who became a surgeon. Ernst was born in Vienna during World War 1, a time when people were going hungry. Worried for his family’s health, Landsteiner bought a goat to provide them with milk and personally went foraging for herbs; Landsteiner and his family were living in the village of Purkersdorf about 10 miles from the center of Vienna, which Landsteiner believed was a better environment for a family. In 1929, six years after they arrived in America, Landsteiner and his family became American citizens. In 1937, Landsteiner sued an American publisher for including him in the book Who’s Who in American Jewry, arguing that he was not a Jew, having converted to Roman Catholicism almost five decades previously. Landsteiner said, “…it will be detrimental to me to emphasize publicly the religion of my ancestors.” He lost the lawsuit. Landsteiner was an excellent pianist and a secret devotee of detective novels – he was embarrassed about his, because he felt someone with his background should read more cultured literature. Landsteiner became an Emeritus Member of the Rockefeller Institute in 1939, but refused to retire, and continued working with great energy. Latterly, his wife Leopoldine was diagnosed with thyroid cancer and Landsteiner worked all the harder, searching for a way to save her life. Karl Landsteiner died age 75 of heart failure on June 26, 1943. Two days earlier, working in his Rockefeller Institute laboratory, he had suffered a heart attack. His wife died on Christmas day six months later. Survived by their son Ernst, they were buried side by side in the Prospect Hill Cemetery, Nantucket, Massachusetts. "Karl Landsteiner." Famous Scientists. famousscientists.org. 1 Aug. 2018. Web.